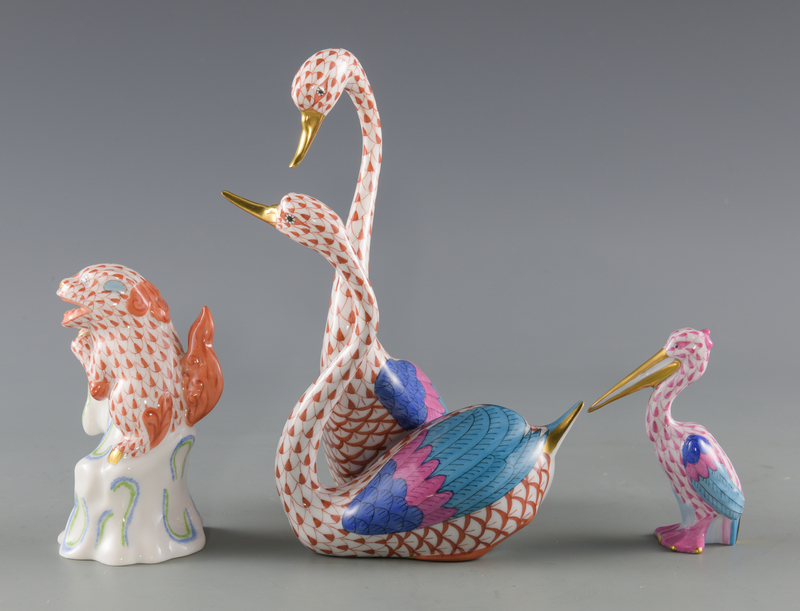 1st item: Porcelain figurine of two swans in rust fishnet pattern with 24K gold accents. 2nd item: Porcelain figurine of a foo dog in rust fishnet pattern with 24K gold accents resting on a white pillar with blue and green designs. 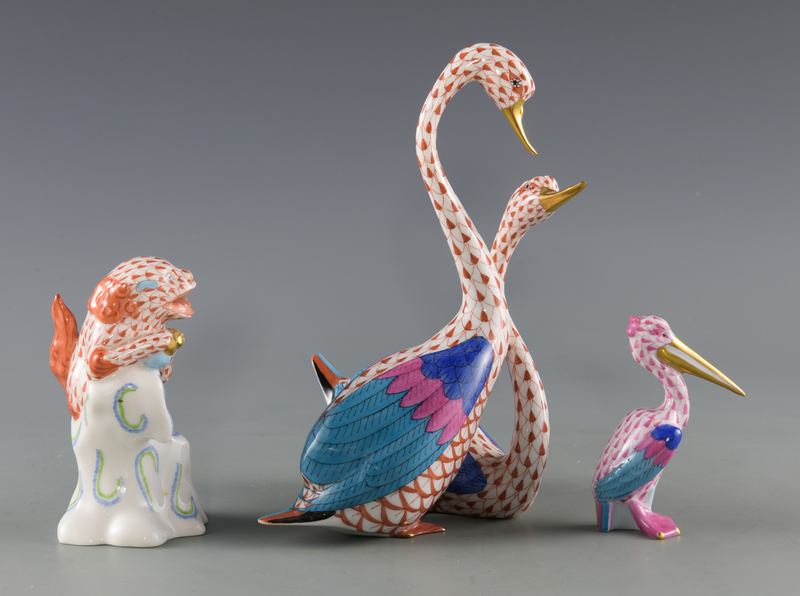 3rd item: Porcelain figurine of a pelican in pink fishnet pattern with 24K gold accents. 4th item: Porcelain figurine of a reclining ram in blue fishnet pattern with 24K gold accents. 5th item: Porcelain figurine of a swan with an egg in blue fishnet pattern with 24K gold accents. 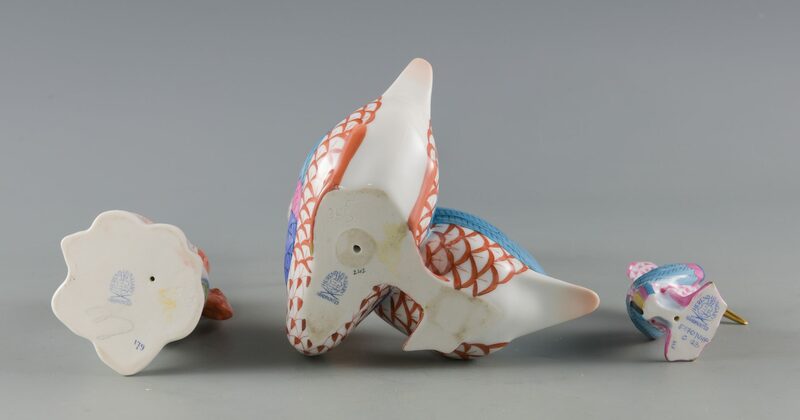 6th item: Porcelain figurine of a seahorse in blue fishnet pattern with 24K gold accents poised on a white and pink shell. 7th item: Porcelain figurine of an upright rabbit in blue fishnet pattern with 24K gold accents. 8th item: Porcelain figurine of an elephant in blue fishnet pattern with 24K gold accents poised on a red and gold ball. 9th item: Porcelain figurine of a frog in green fishnet pattern with 24K gold accents resting on a light blue leaf with black lines. 10th item: Porcelain figurine of a small white and blue dot rabbit with 24K gold accents on a green leaf. 11th item: Porcelain white and green dot rabbit mounted to trinket box with green floral sprays and 24K gold accents. 12th item: Porcelain white and blue dot rabbit mounted to trinket box with blue, red, and green floral sprays, red line and 24K gold accents. 13th item: Porcelain white kitten with blue bow mounted to trinket box with blue, red, and green floral sprays, red line and 24K gold accents. All pieces with blue Herend marks to the underside. Ranging in size from 2" H x 2" W to 7 1/2" H x 3 1/2" W. All 20th century. Provenance: Private collection, Nashville, TN. CONDITION: All items excellent condition with the following exceptions: 9th item: Minute scratch on gold accent of frog's right hand. 10th item: Minute scuffs on body of rabbit. 13th item: Minute red paint mark on surface of box.